Bitcoin Press Release: Coded from scratch in node.js cryptocurrency NODE features 50 – 100 confirmations per second, upcoming NodePay EUR, USD and BTC integration and Proof of Activity algorithm launching next week. After almost a year in development, recently launched NODE is a second generation cryptocurrency built from scratch in node.js that features encrypted messaging and NodePay launching in February 2015: the first hybrid international electronic payment system that allows users to pay bills and shop online, and send and receive remittances in NODE, USD, BTC and EUR. The NODE wallet client is 100% original and will feature full NODE, EUR, USD and BTC integration for sending and receiving funds on a decentralized peer to peer network. Experimental NODE wallet clients are also available for download for Windows, Mac and Linux. With more than 50-100 confirmations per second NODE possesses lightning fast confirmation of transactions; allowing NODE to compete with Visa. The NODE White Paper contains more information. The NodePay system has a high degree of security, speed of transactions and a wide range of deposit and withdrawal options. NodePay also features some of the lowest fees (ranging from 0%), an easy to use client (simple and intuitive interface), full automation of operations and qualified customer support. The system is designed to be transparent and neutral. All information regarding NodePay money supply is always available in the NODE blockchain: balances can be easily verified and used in real time. No one person or organization can control or manipulate the decentralized NODE protocol because it is cryptographically secure. Whenever users access their wallets they become a node in the decentralized NODE network. 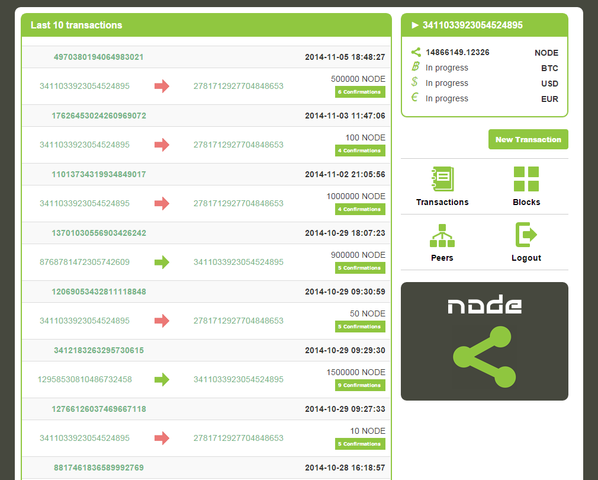 By using NODE users themselves secure NODE’s decentralized peer to peer network. On laptops and ordinary computers NODE users can also earn NODE by helping secure the network and keeping their wallet open through an automatic process called “forging”. In this way NODE is accessible to anyone with a computer worldwide and seeks to curb environmentally unsustainable mining races such as currently being seen with Bitcoin. Next week NODE development team is ready to launch their new in-house cryptographic Proof of Activity (PoA) algorithm that helps users secure the network. With their 100% original code base, accessible wallet at http://nodemoney.com:19775/, simplicity of forging, plans for NodePay decentralized payment network and the active NODE development team ready to release NODE’s original PoA algorithm; NODE is a stand-out in an increasingly crowded cryptocurrency ecosystem. *This press release is for informational purposes only.